Broadbeach Station is relocating soon!! 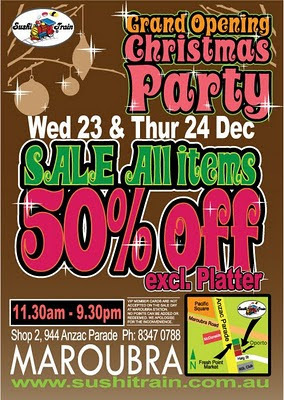 Join us at Broadbeach Station on 19th and 20th for Grand Relocation Sale! All Sushi $3.00 - excl Udon, Bowl, Drinks & Sashimi! See you there!! 2791 Gold Coast HWY Broadbeach on 19th. This holiday season look out for Christmas Cookies - 6pce Gingerbread Cookies delightfully decorated - if you are in NSW. In QLD its a Swiss Roll - delicate sponge cake, rolled with jam and cream! Available for a Limited Time Only - especially for Christmas!! Keep an eye out for our announcement of the Broadbeach Grand ReOpening Sale! !